Thurston: You think I began a dozen global corporations by stooping to thievery? Professor: Well, of course not. Thurston: Shows how naive you are. How else do you get to the top of the corporate ladder! 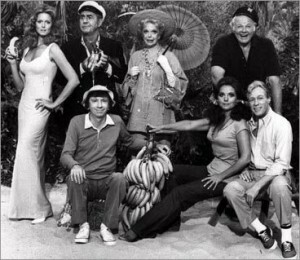 I loved Gilligan's Island as a child. Young and innocent I wasn't capable of delving deep into the hidden meaningbehind the parable. I didn't even know it was a parable.I thought parables were lessons about how to provide enough alcohol at parties. You know, that stuff about tuning water into wine. Just like on the island, workplaces have cultures. If we don't create them they create themselves. As long as humans and their nature is involved it happens. There's the larger corporate culture we may be aware of, even indoctrinated into. It may be attractive to us in the interview. Maybe it was a strong draw to work there in the first place. Companies these days are keenly aware of branding and marketing their corporate culture. Smaller companies may just be a an uncharted isle waiting for someone to to write SOL in the sand on the beach. What companies come to mind when you think of corporate culture? Snap! When the Googleplex was unveiled in 2006 I would have sacrificed a kidney to be an insider there. I wanted everything to be googlesque. I wanted to sit in front of the idea board to have coffee. I wanted a massage during work hours when my neck tensed up. I wanted to take my dog to work! Most of all, I wanted an environment where creativity and experimentation was encouraged and where flops weren't seen as failures. Ah.... freedom to do my best, be me, be motivated and unconstrained.To wear jeans and t-shirts, be anti-social if I wanted to and live in my mind as long as I produced. You have an opportunity to play the role you aspire to. You might not have the title officially but you can study hardto be the stand-in. The way you portray your role affects the culture of your work area. Your work area has the ability to be a role model for company culture. If it stands out it will be emulated and imitation is the most sincere form of flattery. So, if your workplace isn't quite the Googleplex, you can help lead it in that direction.